Ronald Reagan's efforts to eradicate Communism spanned the globe, but the insurgent Contras' cause in Nicaragua was particularly dear to him. Battling the Cuban-backed Sandinistas, the Contras were, according to Reagan, "the moral equivalent of our Founding Fathers." Under the so-called Reagan Doctrine, the CIA trained and assisted this and other anti-Communist insurgencies worldwide. Assisting involved supplying financial support, a difficult task politically after the Democratic sweep of congressional elections in November 1982. First Democrats passed the Boland Amendment, which restricted CIA and Department of Defense operations in Nicaragua specifically; in 1984, a strengthened Boland Amendment made support almost impossible. A determined, unyielding Reagan told National Security Adviser Robert McFarlane, "I want you to do whatever you have to do to help these people keep body and soul together." What followed would alter the public's perception of the president dramatically. How "Iran" and "Contra" came to be said in the same breath was the result of complicated covert activities, all carried out, the players said, in the name of democracy. In 1985, while Iran and Iraq were at war, Iran made a secret request to buy weapons from the United States. McFarlane sought Reagan's approval, in spite of the embargo against selling arms to Iran. McFarlane explained that the sale of arms would not only improve U.S. relations with Iran, but might in turn lead to improved relations with Lebanon, increasing U.S. influence in the troubled Middle East. Reagan was driven by a different obsession. He had become frustrated at his inability to secure the release of the seven American hostages being held by Iranian terrorists in Lebanon. 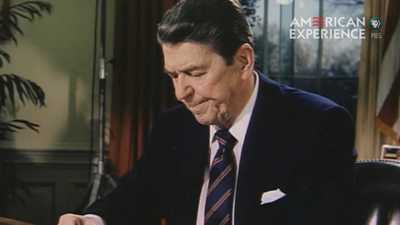 As president, Reagan felt that "he had the duty to bring those Americans home," and he convinced himself that he was not negotiating with terrorists. While shipping arms to Iran violated the embargo, dealing with terrorists violated Reagan's campaign promise never to do so. Reagan had always been admired for his honesty. The arms-for-hostages proposal divided the administration. Longtime policy adversaries Secretary of Defense Caspar Weinberger and Secretary of State George Shultz opposed the deal, but Reagan, McFarlane and CIA director William Casey supported it. With the backing of the president, the plan progressed. By the time the sales were discovered, more than 1,500 missiles had been shipped to Iran. Three hostages had been released, only to be replaced with three more, in what Secretary of State George Shultz called "a hostage bazaar." When the Lebanese newspaper "Al-Shiraa" printed an exposé on the clandestine activities in November 1986, Reagan went on television and vehemently denied that any such operation had occurred. He retracted the statement a week later, insisting that the sale of weapons had not been an arms-for-hostages deal. Despite the fact that Reagan defended the actions by virtue of their good intentions, his honesty was doubted. Polls showed that only 14 percent of Americans believed the president when he said he had not traded arms for hostages. 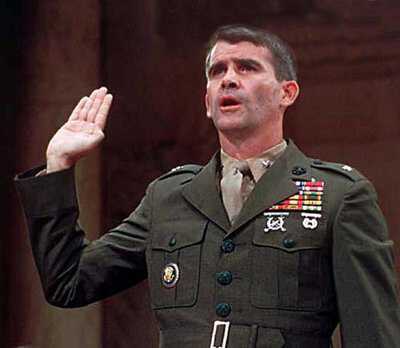 Poindexter resigned, and North was fired, but Iran-Contra was far from over. The press hounded the president: Did he know about these illegal activities, and if not, how could something of this magnitude occur without his knowledge? In an investigation by the Reagan-appointed Tower Commission, it was determined that, as president, Reagan's disengagement from the management of his White House had created conditions which made possible the diversion of funds to the Contras. But there was no evidence linking Reagan to the diversion. Speculation about the involvement of Reagan, Vice President George Bush and the administration at large ran rampant. Independent Counsel Lawrence Walsh investigated the affair for the next eight years. Fourteen people were charged with either operational or "cover-up" crimes. In the end, North's conviction was overturned on a technicality, and President Bush issued six pardons, including one to McFarlane, who had already been convicted, and one to Weinberger before he stood trial. 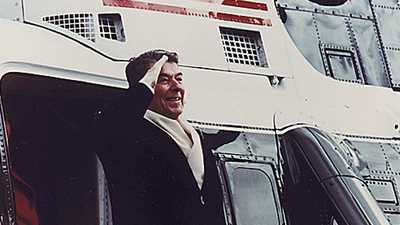 Although laws had been broken, and Reagan's image suffered as a result of Iran-Contra, his popularity rebounded. In 1989 he left office with the highest approval rating of any president since Franklin Roosevelt. In 1982, the economy under the Reagan Administration looked bleak.